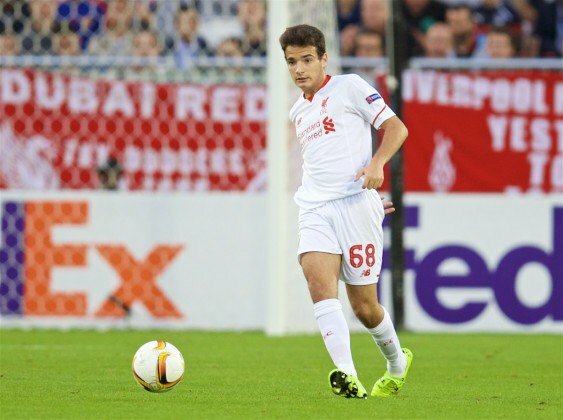 The 18 year old Spanish midfielder who joined the Reds’ Kirkby Academy from Valencia back in 2013 says ‘it was a dream come true’ to make his debut for Liverpool in last nights 1-1 draw against Bordeaux. “It was a big day for me. I have waited for this chance and it is a dream come true to make my debut for Liverpool. “It was very unlucky for Kolo as he has been working really hard. I felt so sorry for him but I had to be ready to help the team. “The manager told me to keep calm and to play my game. “With it being my first game there were a few nerves but I just tried to focus on playing well for the team. The Spain youth international says he benefited from the fact that he had Rossiter for company in the centre of midfield. The pair have played plenty of football together for Liverpool Under-21s. “Jordan and I understand each other’s game,” he added. “We’ve played together for the past two years and support each other. It was great to be out there with him. “Liverpool is a team that always gives chances to young players and that gives you motivation as a youngster. “The manager said well done to me afterwards but I know I have to keep going. We hope so too, Pedro!